Seborrheic dermatitis is a common inflammatory disease of the skin characterized by scaly lesions usually on the scalp, hairline, and face. Seborrheic dermatitis appears as red, inflamed skin covered by greasy or dry scales that may be white, yellowish, or gray. It can effect the scalp, eyebrows, forehead, face, folds around the nose and ears, the chest, armpits (axilla), and groin. Dandruff and cradle cap are mild forms of seborrheic dermatitis, and appear as fine white scales without inflammation. Mild forms of the disorder may be asymptomatic. Symptoms also disappear and reappear, and vary in intensity over time. When scaling is present, it may be accompanied by itching that can lead to secondary infection. The diagnosis of seborrheic dermatitis is based on assessment of symptoms, accompanied by consideration of medical history. Treatment consists of vigorous shampoos with preparations that assist with softening and removing the scaly accumulations. For mild cases, a nonprescription shampoo with selenium sulfide or zinc pyrithione may be used. For more severe problems, the doctor may prescribe shampoos containing coal tar or scalp creams containing cortisone. The antiseborrheic shampoo should be left on the scalp for approximately five minutes before rinsing out. Hydrocortisone cream may also be ordered for application to the affected areas on the face and body. Application of the hydrocortisone should be discontinued when the condition clears and restarted with recurrence. This chronic condition may be characterized by long periods of inactivity. Symptoms in the acute phase can be controlled with appropriate treatment. Acne — A chronic inflammation of the sebaceous glands that manifests as blackheads, whiteheads, and/or pustules on the face or trunk. Psoriasis — A skin disorder of chronic, itchy scaling most commonly at sites of repeated minor trauma (e.g. elbows, knees, and skin folds). It affects up to 2% of the population in Western countries—males and females equally. 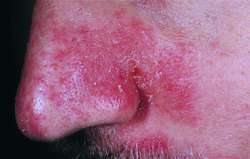 Rosacea — A chronic inflammation of the face, with associated scattered round nodules and increased reactivity of the facial capillaries to heat. It is most common in females, aged 30-50 years. The condition cannot be prevented. The severity and frequency of flare-ups may be minimized with frequent shampoos, thorough drying of skin folds after bathing, and wearing of loose, ventilating clothing. Foods that appear to worsen the condition should be avoided. Monahan, Frances, and Marianne Neighbors. Medical Surgical Nursing: Foundations for Clinical Practice. Philadelphia: W. B. Saunders, 1998. 1. affected with or of the nature of seborrhea. 2. pertaining to those areas of the body whose sebaceous glands are abundant, as the scalp, face, and axillae. seborrheic dermatitis an inflammatory condition, usually of the skin of the scalp, with yellowish greasy scaling of the skin and itching. A mild case in the scalp is called dandruff. Seborrheic dermatitis can involve other areas such as the face, neck, central part of the trunk, or axilla. The underlying cause is not known; the hair and scalp may be excessively oily, but the connection (if any) between this and the dermatitis is not known. Although there is no specific cure for dandruff, various measures are used to control and relieve it. Most patients can control scalp scaling by frequent use of a shampoo containing zinc pyrithione, selenium sulfide, or tar. The dermatitis responds well to hydrocortisone cream. a common scaly macular eruption that occurs primarily on the face, scalp (dandruff), and other areas of increased sebaceous gland secretion, especially during infancy and after puberty; the lesions are covered with a slightly adherent oily scale. Effectiveness of treatment with betaconazole supports an etiologic role for Pityrosporum ovale infection. a common chronic inflammatory skin disease characterized by greasy scales and yellowish crusts. Common sites are the scalp, eyelids, eyebrows, face, external surfaces of the ears, axillae, central chest, breasts, groin, and gluteal folds. In some people seborrheic dermatitis is associated with paralysis agitans, diabetes mellitus, malabsorption disorders, epilepsy, or an allergic reaction to gold or arsenic. Treatment includes selenium sulfide shampoos, topical and oral corticosteroids, topical antibiotics, proper therapy for any underlying systemic disorder, and avoidance of sweating and external irritants. Kinds of seborrheic dermatitis include cradle cap, dandruff, and seborrheic blepharitis. A common scaly macular eruption that occurs primarily on the face, scalp (dandruff), and other areas of increased sebaceous gland secretion; the lesions are covered with a slightly adherent oily scale. Synonym(s): dyssebacia, dyssebacea, seborrheic dermatosis, seborrhoeic dermatitis, Unna disease. n a disorder of the skin; characterized by loose white or yellowish scales that may feel oily or dry and are located on the scalp, eyelids, eyebrows, or lips. It may also develop inside or outside the ears and the skin of the trunk, specifically in the areas that cover the sternum and near the folds of skin. The origin is unknown, but hereditary factors and fatigue, stress, weather, other disorders of the skin, and poor hygiene seem to increase the risk. A common scaly macular eruption that occurs primarily on the face, scalp (dandruff), and other areas of increased sebaceous gland secretion. Synonym(s): dyssebacia, dyssebacea, Unna disease. affected with or of the nature of seborrhoea. chronic, erythematous, scaly skin plaque which is associated with staphylococcal hypersensitivity. According to JAMA Pediatrics, an industry healthcare journal, seborrheic dermatitis is a common complaint brought to pediatricians. Studies have also shown a causative role of the yeast-like fungus Pityrosporum in the development of seborrheic dermatitis, notes Joel Schlessinger, M.
For sampling of patients with dandruff and seborrheic dermatitis, scraping with the scalpel was used in this study. Unilateral seborrheic dermatitis following a nerve lesion. Its non-greasy cream formula provides intensive moisturization for consumers with atopic dermatitis, dry skin, eczema, healthy skin, impetigo, psoriasis, rosacea, seborrheic dermatitis and sunburn. Safety was demonstrated in 672 seborrheic dermatitis patients aged 12 years and older who applied Extina foam to their face, scalp, and/or chest for 4 weeks. Maximum-strength Scalpicin dermatology formula will help relieve the more intense, chronic scalp itch caused by seborrheic dermatitis or psoriasis of the scalp, he says. When seborrheic dermatitis develops at other ages, it may appear, disappear and then reappear. Keratosis lichenoides chronica (KLC), also known as Nekam's disease, is a rare dermatological disorder of keratinization characterized by development of violaceous, hyperkeratotic papules and nodules typically arranged in a linear or reticulate pattern, mostly localized on the extremities and buttocks and accompanied by facial lesions resembling seborrheic dermatitis. Cradle cap is a form of seborrheic dermatitis that manifests as greasy patches of scaling on the scalp of infants between the second week and sixth month of life. They start using corticosteroids for seborrheic dermatitis or other dermatoses, and the steroids are often 'prescribed' by friends or relatives," said Dr.